Genghis Khan is a fascinating character. I first really read his story in the book Genghis Khan by John Man. His impression on history is hard to underestimate. He united a nomadic people and led them to conquer half the world. Despite his empire fragmenting and declining after his death he left behind a Chinese dynasty - no small matter - and a legend for the Mongolian people that lasts to this day. Thankfully, Mongol doesn't shy away from embracing the legend. It is always tempting for biopics like this to engage in a quixotic attempt to get at the 'real' hero behind the legend. With the passage of centuries having obscured the tracks a historian would need to follow, they can rarely find an adequate replacement for the myth. 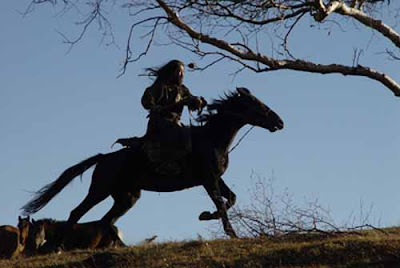 In this film the Mongol god provides almost tangible support for Temudjin. Those moments where something truly incredible happens are genuinely ecstatic. If I describe them now I might spoil it but the film conveys a quiet awe that really sucked me in and made miracles seem really miraculous. The star, a Japanese actor called Tadanobu Asano, handles the challenging role of Genghis Khan with authority, though Temudjin's stern silent act leaves him with only a limited range of visible emotions to play with. The supporting cast are excellent, particularly Honglei Sun, playing Temudjin's blood brother and later adversary, Jamukha. The love story, showing Temudjin's marriage to Borte, has to share the film with Temudjin's rise to become Genghis Khan so never has the space to develop and carry the film as the makers, perhaps, intended it to but it functions well enough to make Temudjin more than just a shouting conqueror. The photography is spectacular. Behind every scene the steppe is invariably stretching into the distance looking gorgeous and lending a powerful sense of the epic to proceedings. That is fortunate because, except in a limited number of action set pieces, the pace is quite slow. Those action scenes have an incredible kinetic kick but they are too rare for this to really be an action junkie's movie - if you go looking to just cheer on grand battles there won't be enough there. Instead, sit back and enjoy a luxurious recreation of an incredible legend.